All is quiet in the Boddy Museum. The thief has yet to strike. Clue: The Great Museum Caper is a game from my nerdly youth that, sadly, I never got to play truly. I admired its place of honor on a shelf for years, and then it probably disappeared in a yard sale some summer day. Recently, after playing Captain Sonar for the first time, I got the urge to finally try this one out after those years, and tracked down a used copy for sale. The Great Museum Caper is an asymmetrical, one-versus-many game for four people published in 1991. One player takes the role of the thief. Their job is to sneak around the museum unseen, stealing paintings and avoiding being detected by the security systems or the characters. The other three players act as “characters,” or detectives or investigators or what have you, who prowl around the museum trying to figure out where the thief is based on the locations of the paintings being stolen and limited information from the security cameras and motion detectors. We played this sort of spur of the moment to wrap up after finishing the evening’s main event. I wasn’t as well prepared with the rules as I might normally have been, but we figured things out as we went and everyone seemed to enjoy the game. It’s not nearly as complex as a modern hidden movement game like Captain Sonar, but it plays fast and easily, which makes it a great fit for my game library. The only drawback to me is the limited player count. Officially, it plays four people, including the thief. In our case, we had five people present, so two buddied up and shared a pawn. I suppose you could stretch player capacity even more by sharing all the pawns, since technically the characters are working together, but I think you’re trending into too many cooks spoiling the broth territory at that point. To sum up, Clue: The Great Museum Caper is a fun, light game with an eye-catching three dimensional board of molded plastic that works best with four players. It’s a great charity shop find if the pieces are all present. Otherwise, you’re probably looking at $30 plus, total, for a complete used copy from an online seller. There was at least one failed attempt where I didn’t understand at all how the thief was supposed to move and the parent I had inveigled to feign interest left rules interpretation up to me. But at that age, I could sense something about the game’s balance was off if the thief were to zoom around the board without restriction. Nominally the characters are those from Clue, Miss Scarlet, et al, but that’s the extent of the connection. Purportedly, according to the BoardGameGeek listing, the game was designed under the name Heist and the Clue theme was added for marketing purposes. Probably my first glimmering this might not be for me was an admittedly emotional reaction to seeing the game would retail for $100 after the Kickstarter. I wouldn’t say cost was a concern, per se, but I’ve come to associate that price point with games that have a high “toy value,” where you’re buying a bunch of figures to paint as much as a game in and of itself. 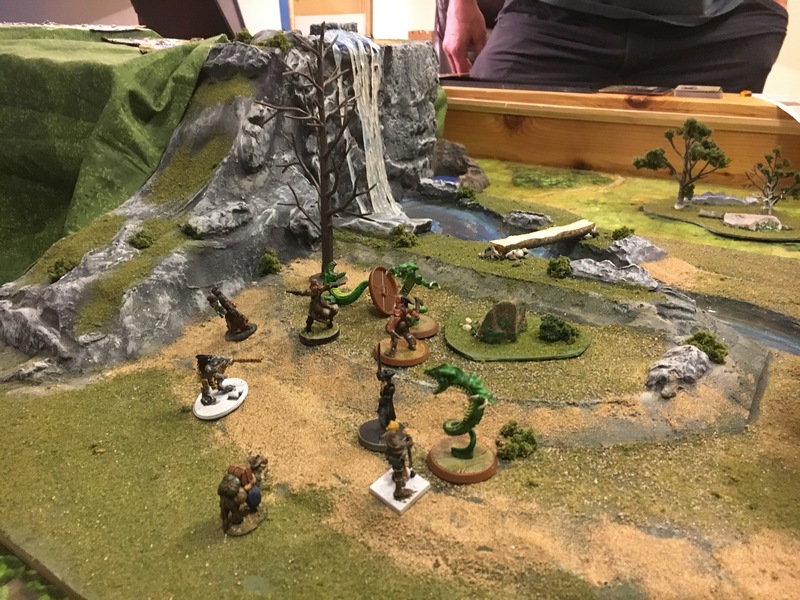 I’m sure there are plenty of games that don’t fit that perception, but it’s one I’ve found myself with after hearing about so many different miniature-based games made possible by crowdfunding. So that was my first personal warning sign. 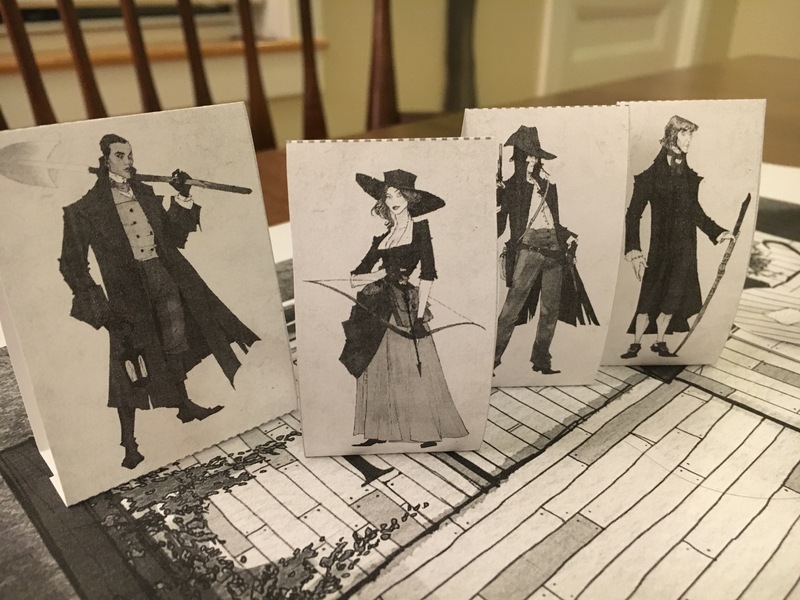 Fortunately for me, the publisher released a print and play version of the first scenario in the campaign. Originally, I skimmed it and thought, “Yeah, that seems fine.” As time progressed and I thought more about what I understood of the gameplay, it seemed increasingly like a wise idea to make use of it. So given that, I decided this isn’t a game I want to own. I would play Legends for sure, but I don’t want to be the one who has it sitting on their shelf, thinking about how infrequently I get to play it — that’s what Eldritch Horror is for these days — or hassling a friend to paint the figures. That was a lot of manual cutting and taping to arrive at the decision, but it was probably worth it compared to arriving there after the box has been dropped on my doorstep. I hung on to watching Fox’s Sleepy Hollow series for way longer than it deserved. The first season is still delightful, though. 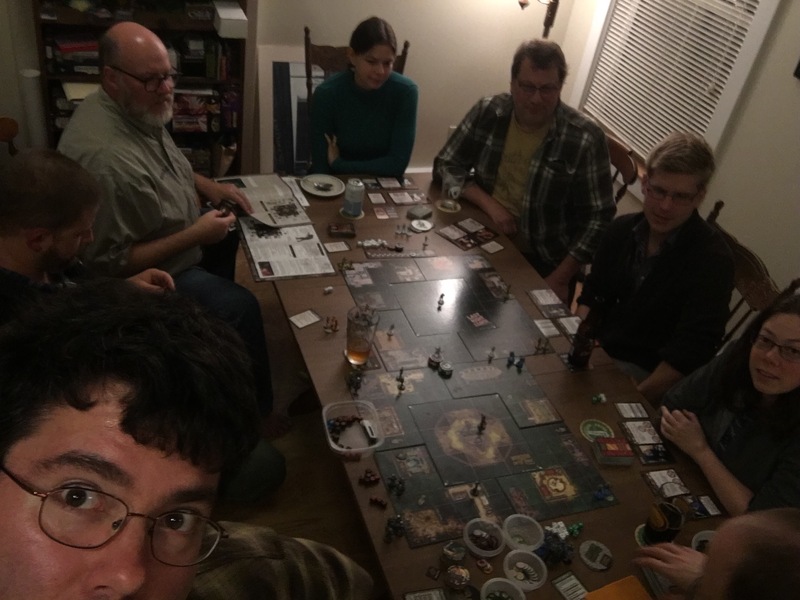 In celebration of Cabbage Night, we played an eight person game of Last Night on Earth — at which point is really a crossover with Invasion from Outer Space, as the game breaks into two parallel games of four players each, with both groups of heroes trying to send a pair of items over to the other board to win the scenario. Unsurprisingly, it was chaotic. 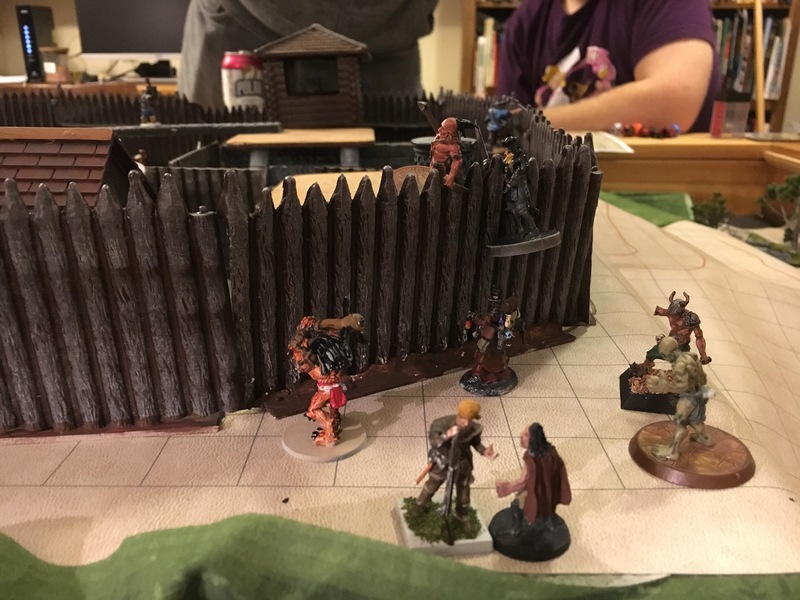 The four monster players took their turn together, as did the heroes. The Martians invading the carnival — including me — got some static for taking longer than everyone else, but dammit, Martians are complicated critters, especially when there’s a pen of angry zard beasts who need their walkies. Trying to cross the Lamoille River in Northern Crown turned out to involve tangling with a maple worm. One of my bucket list role-playing games has been Northern Crown ever since the setting was first published in the mid-aughts. In a fantasy-infused version of North American in 1650, the Republic of Sophia has sent an expedition in support of a lonely trading post on the western shore of a long lake named after the French explorer de Champlain, charged with exploring and claiming the lands there for the republic. 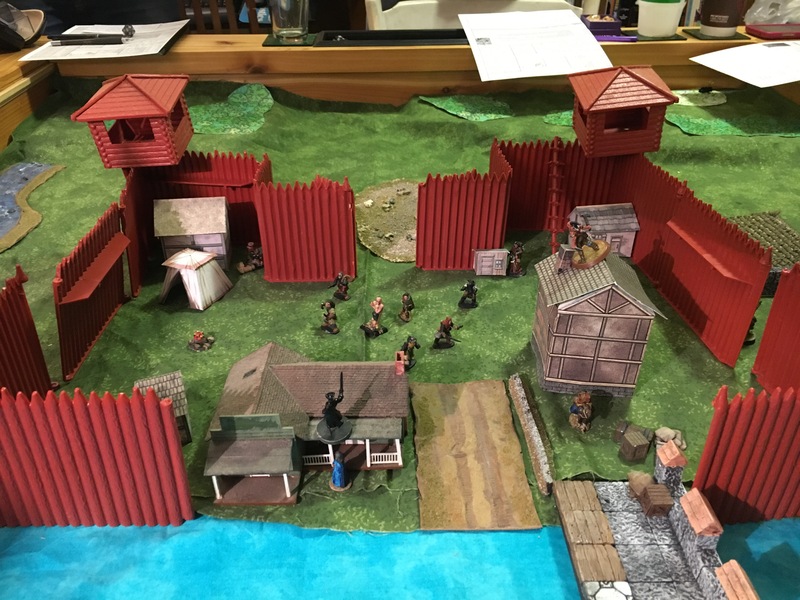 And so the heroes arrived at Ira and Jerusha Allen’s trading post, just in time to fend off marauding bandits who have come to raid the storehouse. 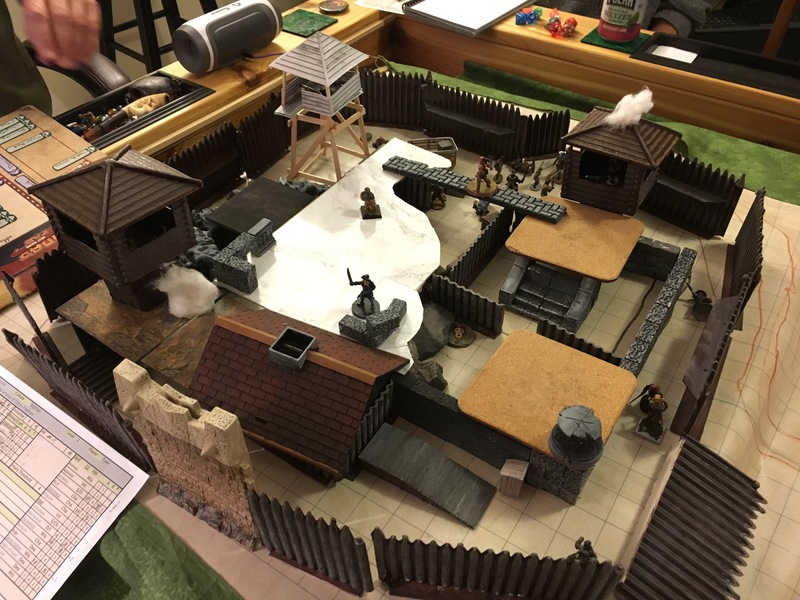 The layout that our GM, Tom, came up with to represent the trading post was pretty damn impressive — especially because he had it hidden under the surface of his game table. We started thinking we were just going to be using a Lego canal ship, then Tom broke out the Heroscape terrain for the interlude where we freed the sasquatch from cruel portagers, and then he said, “We need to move all this,” and started pulling up the table surface to reveal the diorama pictured above. I’m told it’s loosely the plot of Pathfinder‘s Kingmaker adventure path, reconfigured for the lands and peoples of Northern Crown, using an equally loose implementation of Pathfinder rules, with elements from Dungeon Crawl Classics and FATE.